NOTE: Bitnami applications can be found in /opt/bitnami. 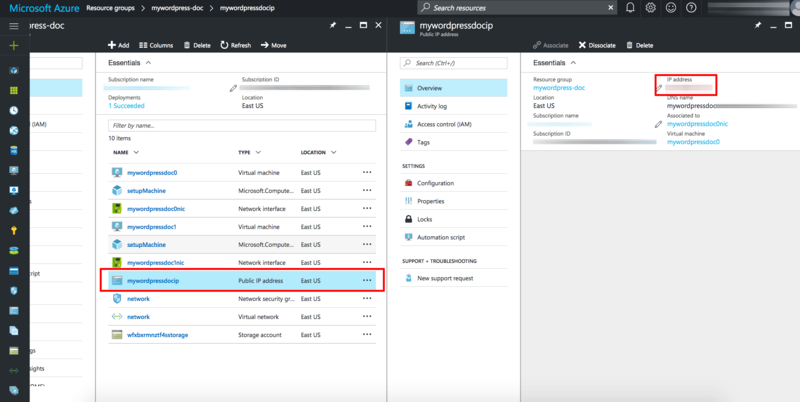 When uploading files to the application server via SFTP, you will need the key pair associated with the servers during the deployment process. 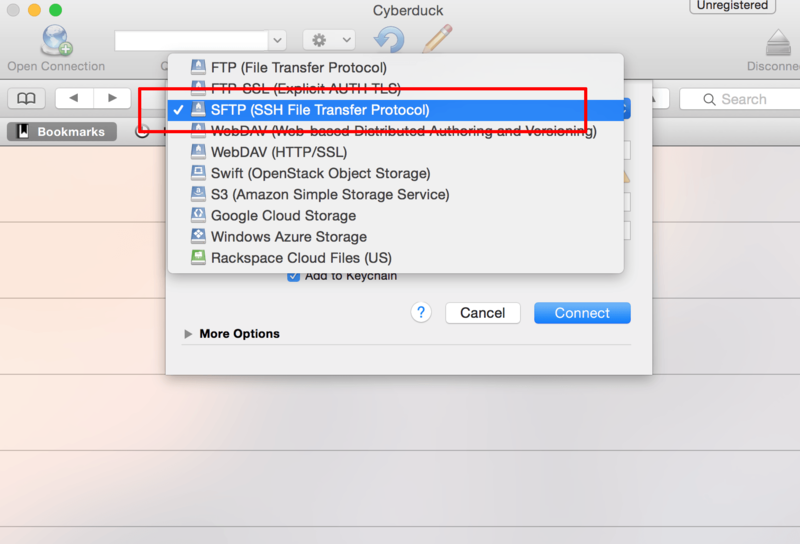 Although you can use any SFTP/SCP client to transfer files to your server, this guide documents FileZilla (Windows, Linux and Mac OS X), WinSCP (Windows) and Cyberduck (Mac OS X). Once you have your server’s SSH key, choose your preferred application and follow the steps below to connect to the server using SFTP. 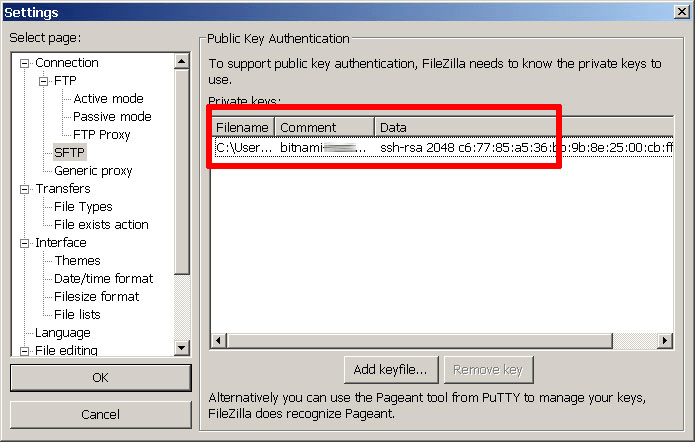 IMPORTANT: To use FileZilla, your server private key should be in PPK format. Launch FileZilla and use the “Edit -> Settings” command to bring up FileZilla’s configuration settings. Within the “Connection -> SFTP” section, use the “Add keyfile” command to select the private key file for the server. FileZilla will use this private key to log in to the server. Use the “File -> Site Manager -> New Site” command to bring up the FileZilla Site Manager, where you can set up a connection to your server. 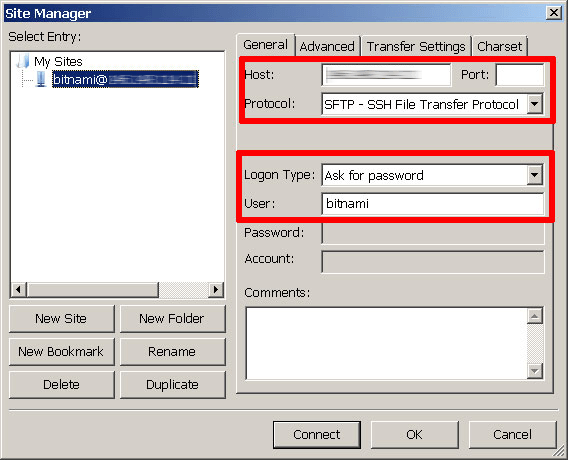 Enter your server host name and specify bitnami as the user name. Select “SFTP” as the protocol and “Ask for password” as the logon type. Use the “Connect” button to connect to the server and begin an SFTP session. You might need to accept the server key, by clicking “Yes” or “OK” to proceed. You should now be logged into the /home/bitnami directory on the server. You can now transfer files by dragging and dropping them from the local server window to the remote server window. 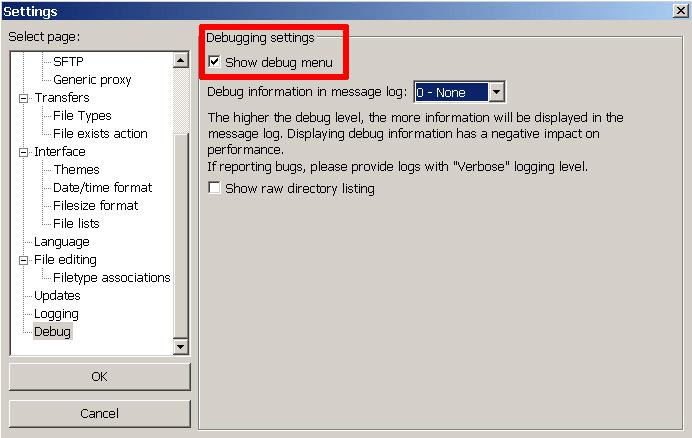 If you have problems accessing your server, get extra information by use the “Edit -> Settings -> Debug” menu to activate FileZilla’s debug log. IMPORTANT: To use WinSCP, your server private key should be in PPK format. 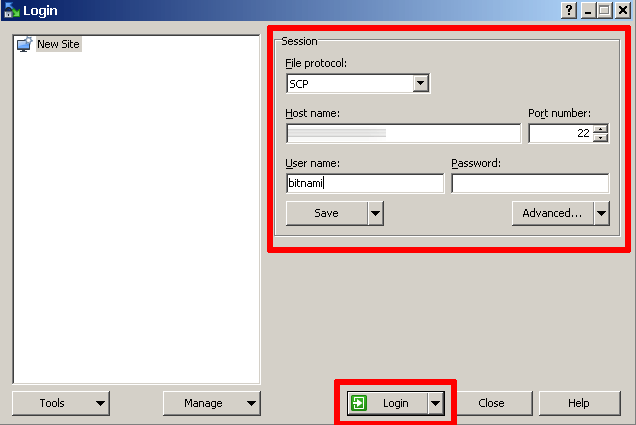 Launch WinSCP and in the “Session” panel, select “SCP” as the file protocol. Click the “Advanced…” button and within the “SSH -> Authentication -> Authentication parameters” section, select the private key file for the server. WinSCP will use this private key to log in to the server. From the “Session” panel, use the “Login” button to connect to the server and begin an SCP session. 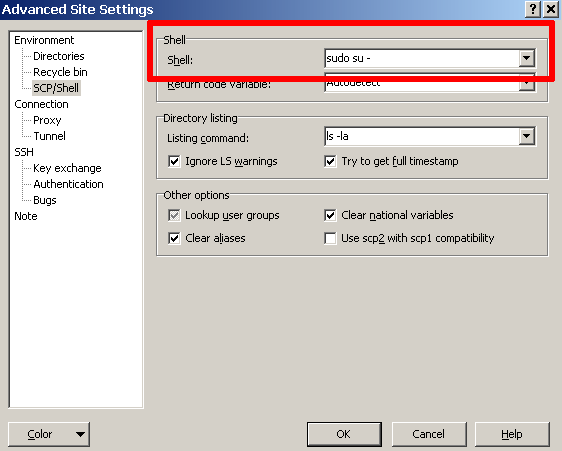 Once you have configured WinSCP as described above, click the “Advanced…” button and within the “Environment -> Shell” panel, select sudo su - as your shell. This will allow you to upload files using the administrator account. Upload the files to the /home/bitnami directory as usual. Then, connect via SSH and move the files to the desired location with the sudo command, as shown below. Replace the FILENAME placeholder with the actual name of the file being moved. 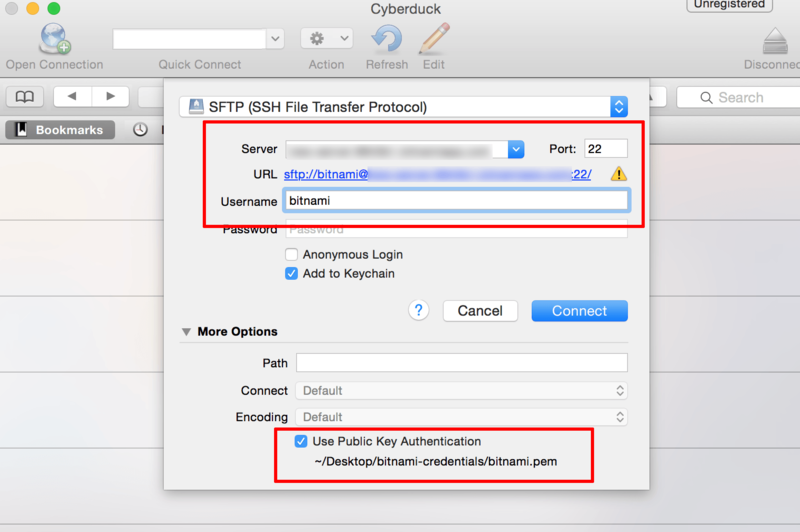 IMPORTANT: To use Cyberduck, your server private key should be in PEM format. Select the “Open Connection” command and specify “SFTP” as the connection protocol. 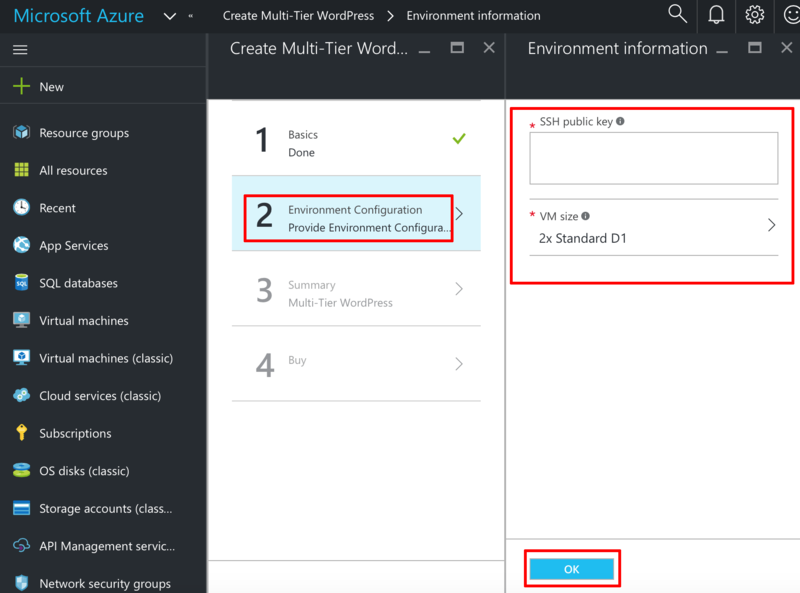 In the connection details panel, under the “More Options” section, enable the “Use Public Key Authentication” option and specify the path to the private key file for the server. Use the “Connect” button to connect to the server and begin an SFTP session.